Oh, how I love finding new mugs to brighten up my Monday. Not just mine, of course - I also extremely very like it when I spot a mug I know someone else will fall in love with - and this week I've managed a double whammy of joy. The Boy and I are unashamedly massive Doctor Who fans. We've both loved the show since they brought it back with Eccleston, and since then I've fallen head over heels a bit (and totally not in a creepily obsessive way) in love with both David Tennant and Matt Smith. And hands up who can't wait for Capaldi? Ooh ooh, me me me me! 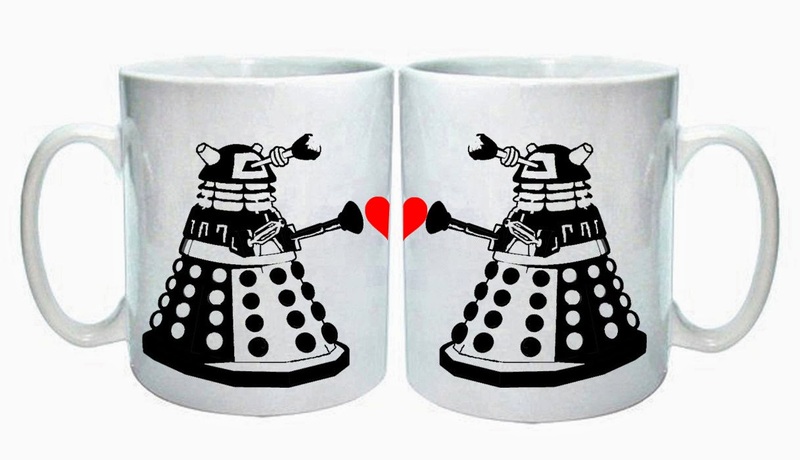 Aaaaanyway, you can imagine my delight when I discovered this pair of 'Dalek love' mugs on Etsy, and I want very much to drink endless cups of tea from them whilst doing dalek voices. Not only are they a perfect joint present for The Boy and I (Hint hint, EVERYONE WE KNOW) but just IMAGINE the notion of two daleks in love! The very thought exterminates my heart. Sigh, it's almost enough to make me not completely terrified of them. Almost.